Mid Atlantic Deck and Fence is proud to announce that we are exclusively the only Maryland distributor of Pool Guard removable pool safety fences and nets! Do you feel the need to protect your loved ones or neighbors from the dangers of your beautiful custom built pool, but don’t necessarily want the look or hassle of a full-sized wooden fence? Well Mid Atlantic Deck and Fence has got a solution for you with our brand new product line of Pool Guards. Pool Guard Premier Pool Safety Fencing provides an elegant and refined statement to any home or property. For almost 16 years, Pool Guard has offered the strongest, safest and most attractive removable pool safety fencing. 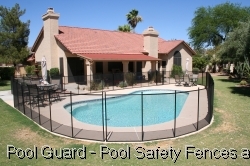 Pool Guard fences exceed the National Safety Council guidelines, as well as the barrier code requirements. They manufacture their fences from start to finish to ensure the highest quality product, which allows them to offer a lifetime warranty. Pool Guard is a perfect choice for swimming pool enclosures and perimeter fencing. Self-closing and self-latching gates are available and feature patented self-closing hinges and Magna Latch. These are a perfect way to add safety without compromising the usability of your swimming pool. The premium grade offers 15 color combinations to choose from that will complement your landscape, pool and home décor. It’s easy to see through, while still offering a great view of your beautiful swimming pool. Pool Guard safety fences can be installed on any type of deck, wood, lawn or concrete pavement. 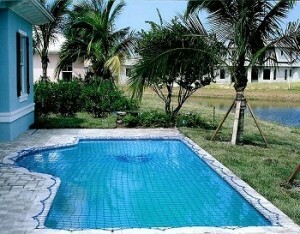 In addition to pool fences, Pool Guard also offers pool safety nets. These nets have been tested and proven to hold up to 485 lbs., while conforming to any pool shape. They are removable in minutes by adults and do not obstruct the view of your pool at all. The Pool Guard exclusive interlocking mesh safety net is the strongest mesh manufactured and has easily exceeded state requirements. Best of all, interlocking mesh is independently certified and ultra violet protected with 2” marine grade border sewn with a locking stitch. Pool Guard is an international company with its corporate headquarters in Tampa Bay, FL and Mid Atlantic Deck and Fence is proud to be its only Maryland distributor. More information on Pool Guard and its many possibilities coming soon to our website at www.midatlanticdeckandfence.com!